Car Rental Guide for online car rental & car hire in Pretoria, South Africa. Competitive car hire rates. All vehicle types - sedan, 4x4, SUV, minivan & pick-up. 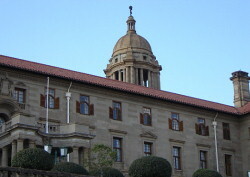 Pretoria has grown into a metropolitan structure encapsulating a rainbow nation. It's here where colourful people from all around gather... where busting trade and scintillating nightlife is offset by the tranquility of nature's reserves. Pretoria is Africa with a touch Europe and a pinch of oriental spice. Hooting taxi's, cars old and new, buses and trains drive past hawkers selling an array of fresh fruit from surrounding farms. Peri-urban areas such as Mamelodi, Atteridgeville and Soshanguve sprung up and grew to feed this ever expanding metropole. And Pretoria has the lilac splendour of jacarandas as its trademark.